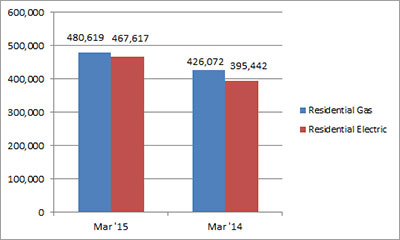 U.S. shipments of residential gas storage water heaters for March 2015 increased 12.8 percent, to 480,619 units, up from 426,072 units shipped in March 2014. 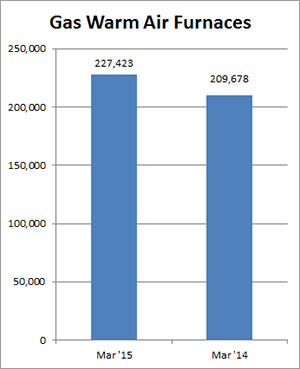 Residential electric storage water heater shipments increased 18.3 percent in March 2015, to 467,617 units, up from 395,442 units shipped in March 2014. For the year-to-date, U.S. shipments of residential gas storage water heaters increased 10.0 percent, to 1,278,975, compared to 1,162,979 units shipped during the same period in 2014. Residential electric storage water heater shipments increased 17.5 percent year-to-date, to 1,290,055 units, compared to 1,097,653 units shipped during the same period in 2014. Commercial gas storage water heater shipments increased 10.2 percent in March 2015, to 10,517 units, up from 9,542 units shipped in March 2014. Commercial electric storage water heater shipments increased 30.3 percent in March 2015, to 9,020 units, up from 6,924 units shipped in March 2014. Year-to-date U.S. shipments of commercial gas storage water heaters increased 12.6 percent, to 27,820 units, compared with 24,705 units shipped during the same period in 2014. Year-to-date commercial electric storage water heater shipments increased 19.7 percent to 21,725 units, up from 18,145 units shipped during the same period in 2014. 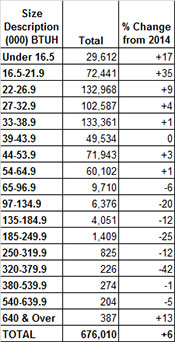 U.S. shipments of gas warm air furnaces for March 2015 increased 8.5 percent, to 227,423 units, up from 209,678 units shipped in March 2014. 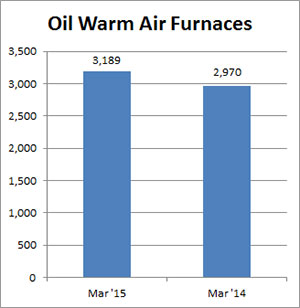 Oil warm air furnace shipments increased 7.4 percent, to 3,189 units in March 2015, up from 2,970 units shipped in March 2014. Year-to-date U.S. shipments of gas warm air furnaces decreased 0.3 percent, to 598,487 units, compared with 600,467 units shipped during the same period in 2014. Year-to-date U.S. shipments of oil warm air furnaces increased 13.0 percent to 8,574, compared with 7,585 units shipped during the same period in 2014. U.S. shipments of central air conditioners and air-source heat pumps totaled 676,010 units in March 2015, up 5.9 percent from 638,572 units shipped in March 2014. U.S. shipments of air conditioners increased 5.3 percent, to 437,339 units, up from 415,218 units shipped in March 2014. U.S. shipments of air-source heat pumps increased 6.9 percent, to 238,671 units, up from 223,354 units shipped in March 2014. 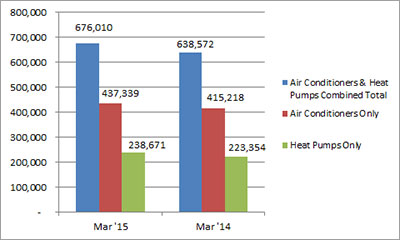 Year-to-date combined shipments of central air conditioners and air-source heat pumps increased 16.0 percent, to 1,631,420 units, up from 1,406,017 units shipped in March 2014. Year-to-date shipments of central air conditioners increased 17.1 percent, to 1,021,179 units, up from 871,826 units shipped during the same period in 2014. The year-to-date total for heat pump shipments increased 14.2 percent, to 610,241 units, up from 534,191 units shipped during the same period in 2014.